A spring assisted mechanism allows for a quick and easy operation. As the AM-BOSS 'Access-Boss'™ attic access ladder is constructed from welded aluminium, it is strong and durable, and all steel parts including springs, are zinc plated. 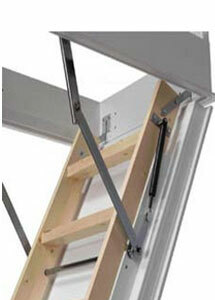 The ladder is mounted in such a way as to allow clearance between the steps and the ceiling hatch for safer footing. Handrail and slim fitted architraves are also available. Dust and draught sealing strips are standard on most types. All models feature concealed hinges. 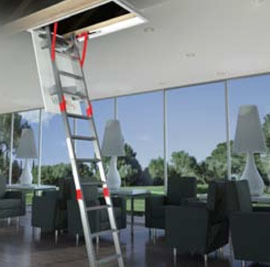 The AM-BOSS attic access ladder is fully adjustable and easily installed! Ingenious spring system counter balance is designed in such a way that when the hatch is closed, the springs are almost relaxed, ensuring life long service. The hatch has a built-in frame, and a rod is supplied to make opening of the hatch easy. Made in 3 sections for strength, easy operation and easy reach, even at 3.3m. Available to order: 4-Section ladders and special size manholes. 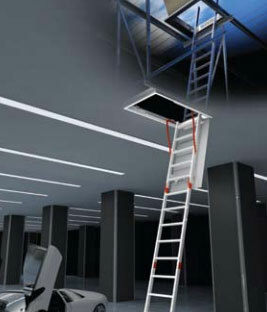 Escape ladders are also available (see link below: Top Opener & Escape Ladders). It is in all of our interests, Customer, Distributor and Manufacturer to supply a product that gives trouble free service, and works for many years without the Customer having to come back and the inconvenience to all of us. 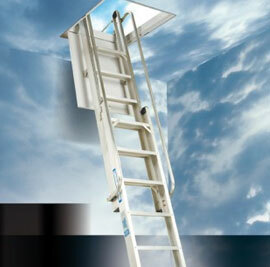 That is why AM-BOSS attic access ladders come with a 20 Year Warranty on all aluminium domestic models. 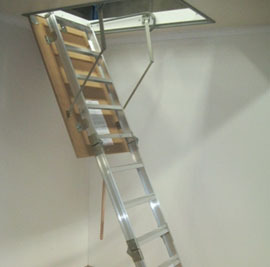 As well as this AM-BOSS attic access ladders are fully assembled and easily installed. Our type 'Access-Boss'™ and 'Big-Boss'™ attic access ladder is manufactured in Aluminium with the flat non-slip treads welded into the stiles. The 'Access-Meister'™ is manufactured in top grade NZ Pine Timber. All come fully assembled and include concealed hinges, draft seal, counter balancing, neat metal architrave, and installation is a breeze. EASY SELECTION OF MODEL NO's: Example: Model No. : 2460 nominates a ceiling height of 2.45m to 2.6m; Model No: 2680 nominates a ceiling height of 2.6m to 2.8m; Model No: 2830 nominates a ceiling height of 2.8m to 3.0m, and so on. We do not believe in cutting to size as the bottom step should be the same distance off the floor as the spacing's from all other steps!!! Each unit comes with instructions and a pole to operate the unit. We have on the shelf models to a ceiling height of 3.6m, but make models up to 5.8m. For more information or your nearest distributor contact AM-BOSS. Aluminum ladder is mechanically counterbalanced by 2 Gas Pistons that allow the ladder to close itself with minimal effort. 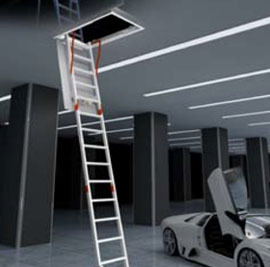 It is a ladder that can be custom made to suit your high ceiling or unusual applications and can even be design to fold out a wall or another vertical surface. You won't have to bother with that shaky step ladder again when you transform your roof space into a convenient storage room. An enzie ladder is strong, durable and safe to use. 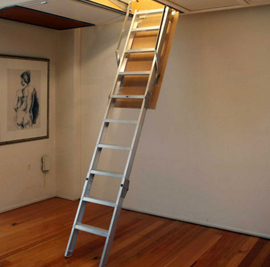 Here is a ladder that is custom made to suit your high ceiling or awkward location. You won't have to bother with that shaky step ladder again when you transform your roof space into a convenient storage room. An enzie ladder is strong, durable and safe to use. At Suncrst Building we know how difficult it is to store all your seasonal household items and precious personal possessions. We can help you use your roof space to provide additional storage for items like Christmas trees, photos and luggage, keeping them out-of-sight but easily accessible. A Hidden Stairway allows you to gain quick access to additional storage space and makes it easier and safer to access your roof space for general maintenance. Manufactured by SSC Skelleftea in Sweden and synonymous with high quality and stylish design for over 20 years and is trusted by customers throughout Europe. 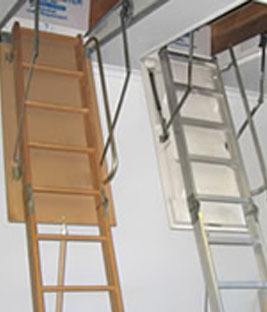 All ladder hatches are insulated and have dust seals to prevent transfer of dust into the internal rooms of your home. All our ladders can be purchased in kit form. An installation service is also available if required. Made for ceiling heights up to 2700mm, these ladders manufactured from slow-grown space are ideal for the DIY enthusiast. The ladder comes completely assembled with instructions on how to install it. Grooved treads for traction and adjustable spring tension complete this economical ladder. There are two options for the opening size - 580x1180mm or 680x1180mm. 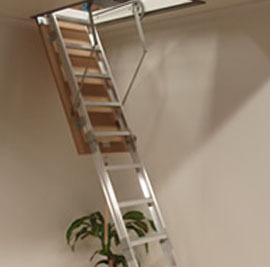 Made for ceiling heights up to 2700mm, the Economy ladder is useful for the DIYer with limited ceiling space to fit other ladders. The hatchway is 540x1130mm and the door is balanced under spring tension. With a built in architrave and gas piston ounter balance, these stylish ladders are constructed for easy installation. Suitable for ceiling heights up to 2650mm, the ceiling opening size is 570x1116mm. The hatch door has 50mm effective insulation and the hatchway is surface treated in a matt white finish. This ladder provides a strong, lightweight option that is stylish and effective. It has a hatchway which is surface treated in a matt white finish and a hatch door with 50mm effective insulation. A gas piston provides the counter balance mechanism. The hatchway has an opening size of 570x1116mm. An alternative option for higher ceilings is the A1220 Deluxe Aluminum Tele 3+1. The top section of this ladder slides down a fixed section before the other two sections fold out. A Roof Space Ladder, also known as an Attic Ladder or a loft ladder is a excellent way to gain storage space and add value to your home. Proven design, quality, service and value. Suncrest building products has been the innovative supplier of attic ladders throughout perth and Western Australia and offer a full installation service. 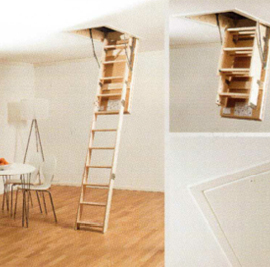 So why should you choose an attic ladder from Suncrest? Safety: World leading counter-balance system, deep treads and plenty of toe room. Strength: Certified strength tests rate our ladders at 150kg POINT load. Security: Lockable hatches keep your valuables safe. Energy Efficient: Our insulated hatches and seals ensure no heat transfer from your attic to your living space. An enzie Easy Close ladder is mechanically counterbalanced by 2 Gas Pistons that allow the ladder to close itself with minimal effort. It is a ladder that can be custom made to suit your high ceiling or unusual applications and can even be design to fold out a wall or another vertical surface. You won't have to bother with that shaky step ladder again when you transform your roof space into a convenient storage room. An enzie ladder is strong, durable and safe to use. An enzie Insulated Easy Close ladder is mechanically counter-balanced by 2 Gas Pistons that allow the ladder to close itself with minimal effort. An insulated and sealed hatch ensures drafts or dust will not enter the room below. Extra toe room and built-in handrails ensure safe and easy use. 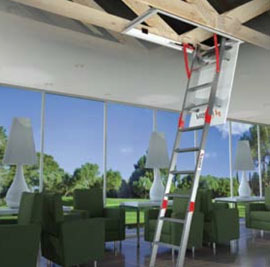 An enzie ladder is strong, durable and easy to use. Maximise you roof space with our versatile attic stair. The Vista Commercial Fold Down ladder access System provides a sturdy, high strength solution where safe access/egress to roof is gained internally. The Vista Commercial Fold Down ladder access System provides a sturdy, high strength solution where safe access/egress to roof is gained internally. The industrial rated Vista Commercial is ideally suited to purlin type roof structure incorporating a suspended ceiling through which safe and easy access into ceiling spaces and onto roof areas is provided for maintenance requirements. The Vista Compact Fold Down ladder access System provides a sturdy, high strength solution thats compact and out of the way. 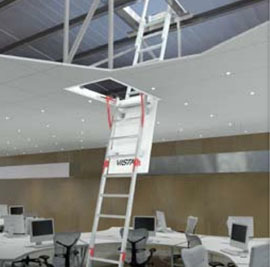 The industrial rated Vista Compact is ideally suited to timber truss roof construction allowing positioning of the ladder between the trusses providing safe and easy access into ceiling spaces for storage and general access. the Vista fold down access Ladder System provides a sturdy, high strength solution where safe access/egress to roof is gained internally. the industrial rated Vista compact is ideally suited to timber truss roof construction allowing positioning of the ladder between the trusses providing safe and easy access into ceiling spaces and onto roof areas for maintenance personnel. The Vista Maxi Fold Down ladder access System provides a sturdy, high strength solution where safe access/egress to roof is gained internally. The industrial rated Vista Maxi is ideally suited to higher purlin type roof structures incorporating a suspended ceiling providing safe and easy access into ceiling spaces and onto roof areas for maintenance requirements. 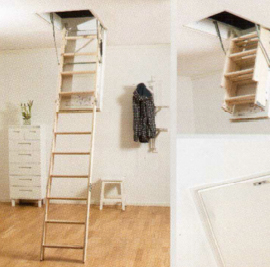 A Signet Attic Ladder is the ideal way to gain access to extra storage space, attics and lofts and provides safer access to the roof space of all types of projects. 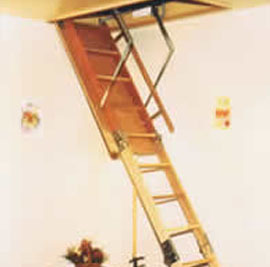 A fixed retractable attic ladder provides its user safer access in comparison to an unstable step ladder that some technicians and mechanics may use. In addition to this, attic stairs are also more prattical to use as you don’t have to lug a large step ladder to gain access to your attic. Having an attic ladder installed in your property is an ideal way to store your unwanted clutter and items that aren't used on a regular basis. Simply fold down and climb your Signet Access ladder to gain access to that large amount of space that you never thought you had! 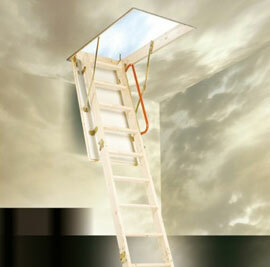 Once you’re done with your attic access ladder just fold or slide it back into your roof space and close the hatch. 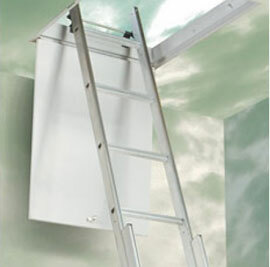 This Spacemaker Aluminium Sliding Attic Ladder is a simple, quality two section standard domestic loft ladder that is easy to fit and ideal for occasional use. 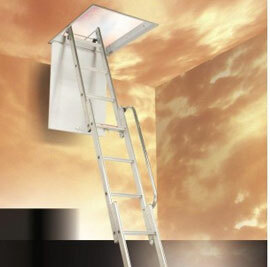 The Easiway Aluminium Attic Ladder has three sliding sections and a handrail for added safety when in use. Designed for occasional use in the home, this quality loft ladder is easy to use & suitable for openings from 508mm x 432mm. 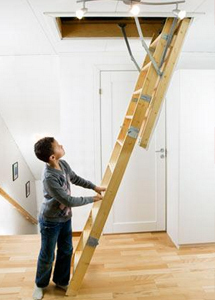 The Eco S Line Timber Attic Ladder is a 3 section folding timber loft ladder with an insulated draught proof hatch. 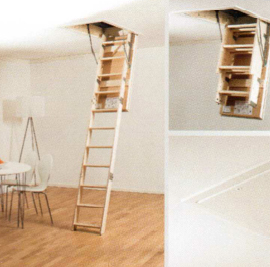 It is an attractive timber attic ladder which is ideal for attics or lofts with limited headroom or where a clear attic floor is required. 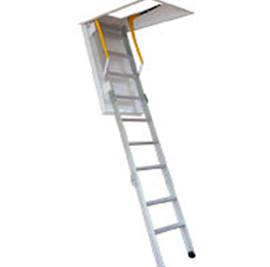 The Deluxe Stairway Attic Ladder is a heavy duty, high performance aluminium ladder for daily domestic and industrial use. 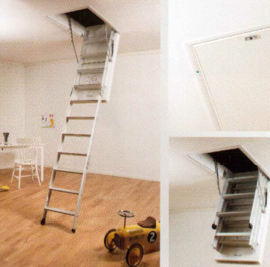 The Deluxe Attic ladder is ideal for relatively high frequency and onerous conditions of use and storage.